This elegant, fascinating architectural home was build by Sir Baker in 1902. Experience the peace and tranquillity of this luxurious guesthouse against a backdrop of the Nieuwveld Mountains. Cape Karoo Guesthouse is perfectly situated between Johannesburg and Cape Town/George. It has a romantic and unique sense of style in the heart of the Great-Karoo.<br /><br />We offer four luxurious and spacious en-suite rooms, equipped with 100% cotton bedlinen, anti-allergenic duvets and pillows, bar fridges, complimentary tea and coffee, DStv, air-conditioning, insect repellents, hairdryers, complimentary toiletries and heated blankets. Each room has its own entrance. 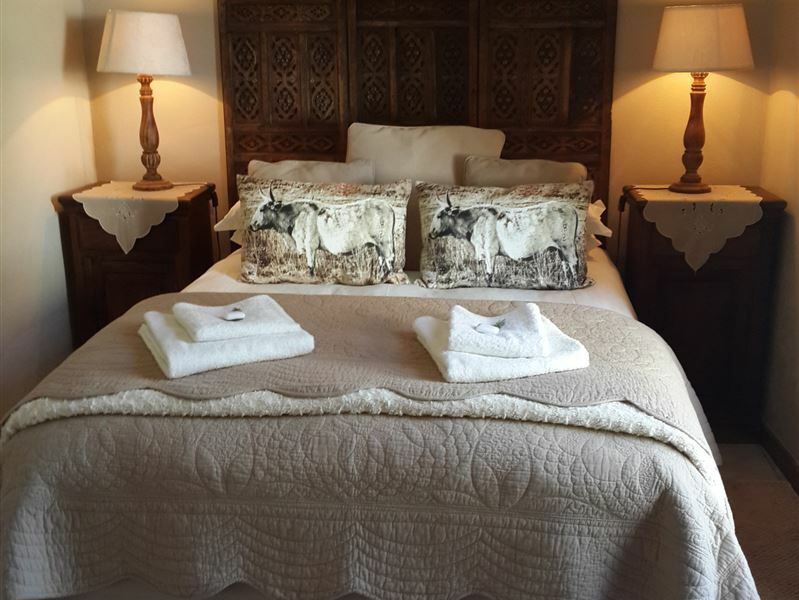 Rooms lead out to a refreshing country atmosphere in the enchanted garden full of bird life with the most amazing mountain views under the breathtaking stars.<br /><br />On request a full English and Continental breakfast can be served. For dinner we have braai packs available on request for those who want to enjoy the famous organic super A-grade karoo lamb chops and beef sausage. <br /><br /> <br /><br />Our guest house is near a grass golf course, and the Karoo National Park - with lovely scenic routes and more than 6000 fauna & flora species. There are also two endangered species, the Riverine Rabbit and the Black Rhinoceros, which have been successfully resettled. The park is home to five tortoise species, the most in any conservation area in the world. The park also has challenging 4x4 routes into the mountains, walking and fossil trials. <br /><br />We are near the N1, but guests can only hear the sounds of nature. We are approximately 10 km away from the airport and within the vicinity of the Chris Barnard Museum. Visit 400 year old engravings from the herb guru king in Nelspoort, Malteno Pass and the indescribable Meiringspoort.<br /><br />Secure off-street parking is available behind locked gates. Enjoy warm hospitality and excellent service. We speak English, Afrikaans and Zulu. Smoking is permitted in the garden area and on the veranda. We are pet and child friendly. Cape Karoo Guesthouse is a member of the Beaufort West Tourism Bureau. "Clean units, warm atmosphere and friendly people and lovely food." "A real oasis at the end of a long day traveling"
"We were met as we arrived." "They didn&apos;t offer a to-go bag as an alternative to missing breakfast due to an early departure." "THE ACCOMMODATION WAS COMFORTABLE & WELL APPOINTED BUT THE AIRCONDITIONING WAS NOT FUNCTIONING WELL ENOUGH - A MAJOR DISAPPOINTMENT . IT IS AN OFTEN OVERLOOKED FACTOR & ABSOLUTELY CRITICAL TO A RESTFUL NIGHT&apos;S SLEEP IN 35 DEGREE HEAT"
"What a surprise inBeaufort West. Felt like arriving at an oasis. Cobbled driveway and cool garden setting. Rooms beautifully decorated and quality bedding. Hosts were very welcoming and looked after us. Breakfast was sociable as we all sat around a large table in the spacious kitchen setting. Have made a note in my book of travels. Will definitely see us again." "Thank you to Cape Karoo Guesthouse!My dog and I received a warm welcome and were treated like old friends!I have already recommended your place to all my friends and family, I only wish I could have stayed longer.Thank you from both of us!Kind regardsRyan Roodt"
"This is the second time that we stay at cape Karoo and again it was a wonderful experience. The reception was very friendly and felt like coming back to visit family. We wanted to leave early and therefore missed breakfast. We did however had supper at the new restaurant at the filling station owned by the owners of Cape Karoo and the food was very good.The room is well equipped and the air conditioner helped a lot to cool the room down to have a comfortable sleep. Temp earlier the day 42 degrees.I will definitely sleep there again if my travels take me there. " "Beautiful little gem. Home away from Home..."
"peopel very friendly and helpful. Clean accomadation."